White, off white, gray white, blue gray, green gray… If you ever find yourself standing dumbfounded in the paint aisle of your local hardware store, you’re not alone! Choosing paint colors is one of the most difficult decisions when it comes to decorating your home. Although it’s fairly easy to fix, selecting the wrong paint color can be a costly (and time consuming) mistake. Lucky for you, we have a whole lot of experience in choosing paint colors to fit your specific style and to make your home more appealing in terms of staging and selling. Neutrals are far and away the best choices for paint colors that appeal to the masses. While gray is all the rage in today’s interior design, taupes, tans, and neutral blues and greens are also safe bets. Just be sure to stay away from colors that are too yellow or too golden, as they can appear dingy in certain light. Jewel Tones are best kept to small accent walls or exceptionally large rooms, and always best when juxtaposed with white trim or wainscoting for a bright accent. While not everyone appreciates bold colors on interior walls, dark, bold jewel tones can bring warmth and appeal to an otherwise wide open space. 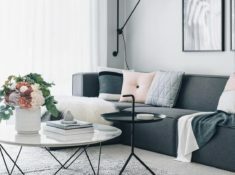 Brights are not often a home stager’s friend, so try to steer clear of colors that are too bold when in the process of preparing your home to sell. If you’re worried about your design looking too sterile, read up on our post about making modern design more inviting and opt for colors such as camel brown and varying colors within the same family to bring more visual interest to the space. Still stuck on picking a paint color for your home? Contact us today for a color consultation!